RodPrjónar: Eva's lopapeysa: Details and pictures. Mini lopapeysa TUTORIAL CORRECTION. Northern lights!! Eva's lopapeysa: Details and pictures. Mini lopapeysa TUTORIAL CORRECTION. 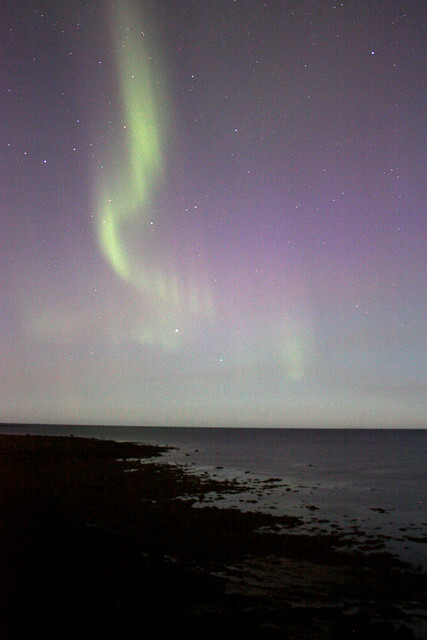 Northern lights!! Even though Eva's lopapeysa is already finished and with her in Berlin I have neither shown pictures of it since the steeking neither talked about the details! Folded and ready to go! * Yoke pattern: Taken from Héla, changing the colors and their distribution. (available for free at www.istex.is). * Yarn: Plötulopi (double thread). * Needles: 4.5 for ribbing and 5.5 for the rest. Crochet hook 4.5mm. * Size: To fit Eva. 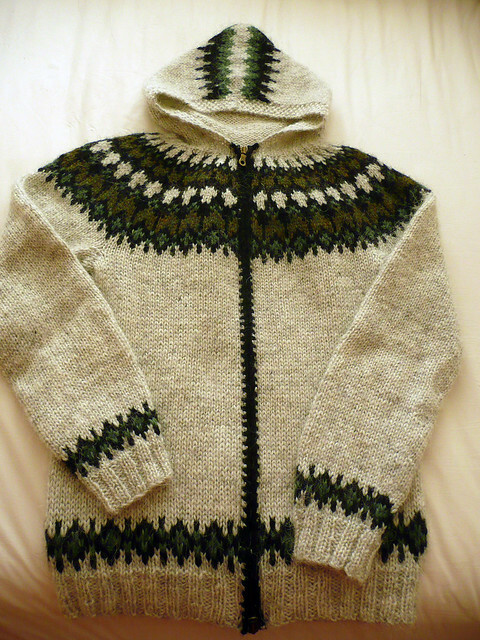 * This lopapeysa was knitted just like any other from bottom up. * I made a 2x2 ribbing. 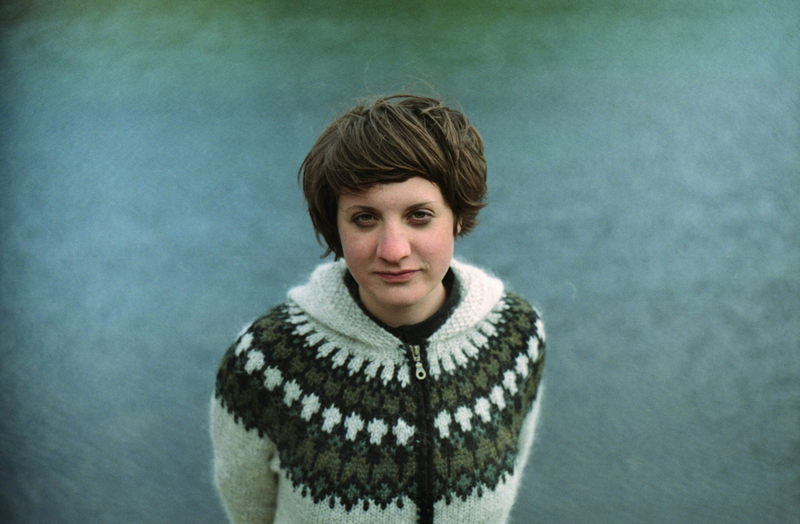 * Knitted the body and the both sleeves and joined them to knit the yoke. * Since this was going to be a cardigan I added two purl stitches in the middle to be able to sew and steek. * This was the first time I was knitting a cardigan with a hood. The hood is knitted flat, shaping it with a few increases. * The pattern on the hood was also knitted flat. This was the most challenging part of the hole lopapeysa. 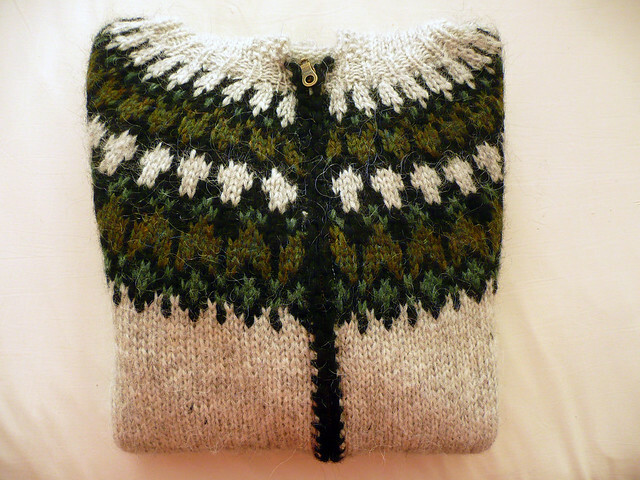 I had never knitted fair isle flat before.I must admit that I hated it (a little bit), especially the purled rows! * To make the pattern on the hood is was also necessary to apply intarsia. Also my first time. It wasn't difficult at all! The important thing is to twist the yarns in order to avoid holes where the colors change. * Finally, the hood was grafted using kitchener stitch. * After steeking I made a crocheted border using black double folded lopi with a hook one size smaller that the needles I used to knit the cardigan. I made single crochet (sc) every other stitch along the edge. 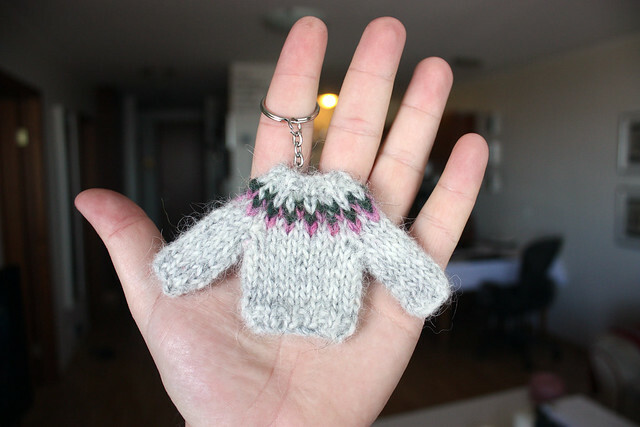 I made a new minilopapeysa keyring to check if the tutorial I made before was OK. Trying new colors and checking the tutorial. Well, I had to fix a couple of things, nothing terrible. * The decreases of the yoke: The second row if decreases should be [k1, k2tog] instead of [k2, k2tog]. * And the 1x1 ribbing of the seck should be just 1 row and cast off tightly instead of 2 rows. I already edited the tutorial so now it is alright :) Sorry about this silly mistake!! 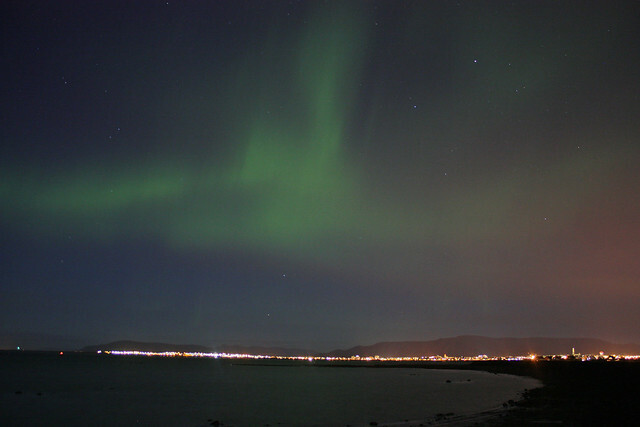 And finally, last night I saw the northern lights for the first time this season! They were not as strong (and also the moon was WAY too bright!) and they were not dancing so much but they were easily spotted. 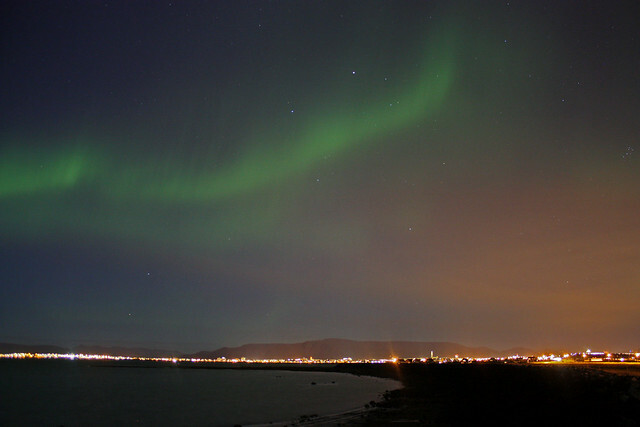 This is the first time I see them so early in September... now this is just the beginning of the northern lights season! There will be plenty of time to spot them again... at least until april! From Álftanes looking to the west. From Álftanes. I really like it when it is possible to see the reflection of the light on the water. Ofsalega fallegir litirnir í peysunni! oiga el chalequito lindo , me encanta, y las fotos preciosas, que era, una estrella ? que lindo y muy romantico, me encanta , precioso todo !!! The lopapeysa (I can't believe how easily and quickly I can write that now, without looking:-)is beautiful. I really like the colors and the design you chose. I agree that crocheting around the hood would not look right. I didn't realize before that the edging is seed stitch. I do like it along the zipper, though. Looks neat. Lucky, lucky Eva. Love the walk-away photo showing the hood. 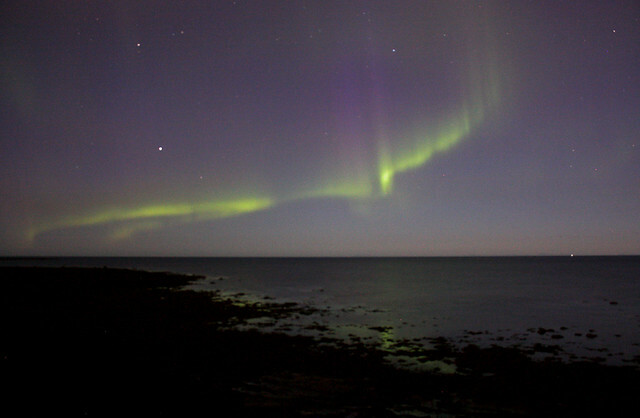 Your photos of the Northern Lights made my heart ache. It's been a long time since I've seen any and so am reminded of another thing I miss living here in the South. If you look at a US map, you can find the state that is a peninsula shaped like a mitten. That is Michigan, the land of my youth (at least, most of it). Way up at the upper border of this lower peninsula, and also in the upper peninsula of MI, you can see the Northern Lights. Often I was fortunate to be up there when they occurred. They truly are beautiful. I loooved your photo with the city lights. So gorgeous! Please do share more with us as you take them. Hope you are having a nice weekend. Alex: jejeje. Cuál dibujo? El patrón de los hombros del chaleco de Eva? Ese lo encuentras gratis aquí: http://www.istex.is/english/free-patterns/ Se llama héla. 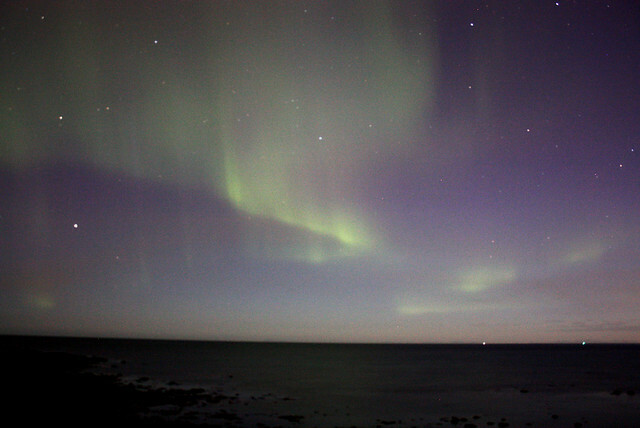 Las fotos del final son de las luces del norte o aurora borealis. Son increíbles! Ahora acabo de postear más fotos que tomé esta noche... de verdad increíble!! Gracias por pasar Alex! Besotes!! Judi: hehe, you're becoming an expert in lopapeysas! The pictures of Eva are really nice. 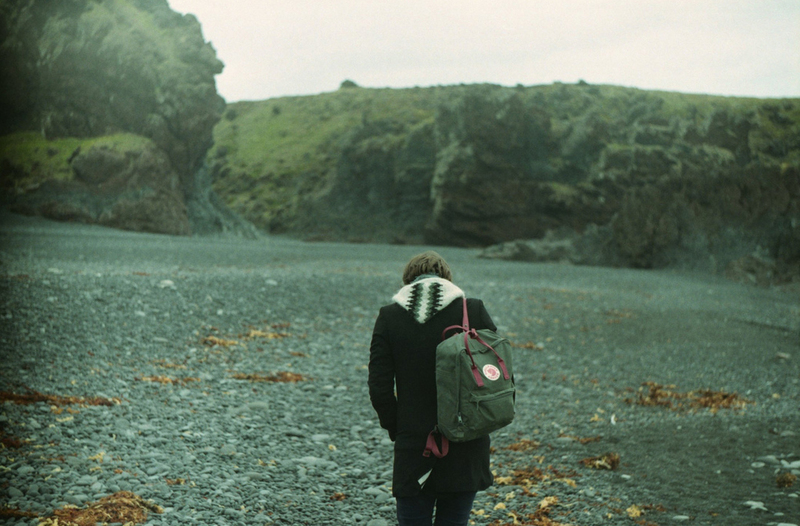 A friend of mine took them on a short trip we took together to Snæfellsnes. I tihnk that Eva looks really cute with those colors (well, Eva looks always cute... she is adorable... and cute!). The mini lopapeysas... I love to make those! It is nice to play with the colors and see what happens. Great lopapeysa! It really suits Eva. I like this one most of all. Dios mio! es impresioante!!! a mi con lo que me encanta la fotografía que daría yo por estar ahi bajo esa bonita aurora! Mamma mía... me dan ganas hasta de llorar de lo impresionate que llega a ser!! Hola desde España! Seria genial si dedicaras algun post a explicar como se hace un lopapeysa en español!! Entender las instrucciones en ingles no es problema, el problema es cuando una no es una experta en "knitting"... lenguaje tecnico de los puntos y demás en vez de ingles parace chino!! Imposible de deducir... quiero hacer uno pero no me gusta ninguno de los "yokes" que veo. Quisiera diseñarlo yo misma... pero no acabo de entender el sistema. Encontre un programa online donde se puede dibujar el estampado y todo lo que dibujo sale horrible! Quisiera tambien ponerle cremallera y capucha, pero son las instrucciones mas especificas y por tanto, las mas dificiles de entender... Si fueras tan amable, a mi me encantaria aprender como se hace!!! !